Is it time for you to focus on ways to grow your email list for your blog or website? This is the next project for my blog. I have quite a short email list at the moment, but I’m looking into various strategies to help me increase my readership. When I was approached by Interact about creating a quiz to help grow my email list I was super excited to collaborate with them. They provided me with a free subscription to their service in exchange for creating a post about my experiences with them. But when I got inside their website I was totally overwhelmed. I have to be honest here – I am a fly-by-night style blogger. I am not very organized, and I am learning HTML, and WordPress backend stuff, all on the fly. Plus, I have no coding experience, no real writing experience, and definitely no marketing experience. My first look into Interact and their quiz generating platform scared the living daylights out of me. I actually wanted to just withdraw from my arrangement with them and not even go back there. But after I looked around a bit, it wasn’t as scary as it seemed. The one thing you do need to customize is the end pages of the quiz. This is where your quiz taker is required to enter their name and email address, which is how you get them subscribed to your email list. The first section is straightforward – what fields do you want filled out, edit colours, font size etc. The second page (after you hit save & continue) is where you tell Interact what mail service you’re using. For me it was MailChimp, but there are a ton of options there. After I choose mailchimp it wants to know what list to add the subscribers to. I only have one list so this wasn’t a tough question for me. I toyed with the idea of starting a new list, or maybe a sub list, with a different “thanks for joining me” page that included the quiz results. After I poked around trying to create that, I gave up. It was way too much work! So my quiz takers get added to my only list, and later I can go back and classify the people into my sub categories once I get feedback from them. There are a lot of options for merging quiz results and email lists – I have not yet taken the time to learn how to adequately do any of these options. You can use all sorts of different fields, and you can create separate “welcome” emails tailored to each result the quiz taker gets. I’m sure there a lot of other things I’ve never even thought about inside my email list management system! After you create a quiz, you have to get it out there into the world so people will take it! I didn’t know how to do that at first. There are lots of options for just sharing the post to your social media and letting people take it. The Share and Embed button at the top right of the page takes to you a page with your HTML code, as well as tabs for sharing a direct link or social media share options. The popular option on using these quizzes suggests you create a page inside your website with the quiz on it, so when people click through to take it they are actually visiting your blog or website. This keeps them on your page and able to click through to other pages or posts when they are done taking the quiz. I went ahead and did this – it wasn’t too challenging. 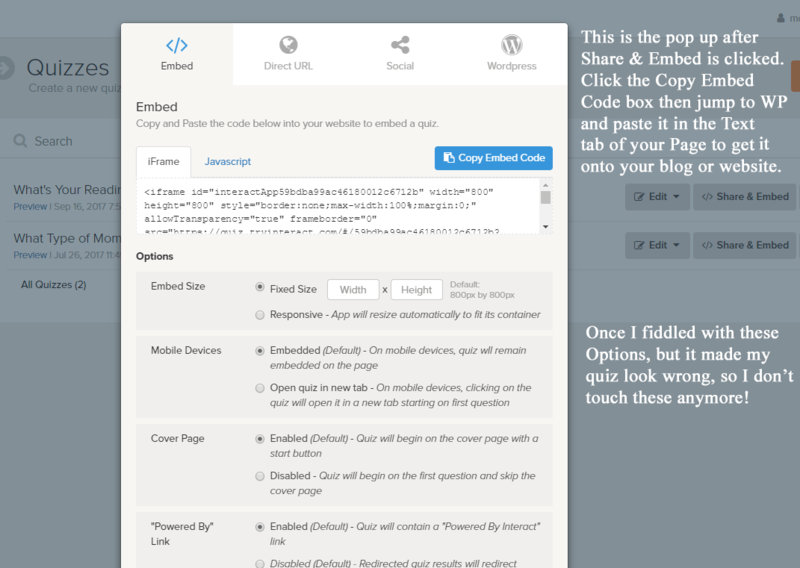 I just copied the Embed Code (as it says in the tab) and pasted it into the text tab of my “new page” I created in WordPress. When I click back to the Visual tab – BOOM! – there’s the quiz, all ready to go. Create a title and hit publish! Your quiz is now ready to share. Of course, Interact also allows you to create your own quiz start-to-finish. You can use your own images, wording, question and answer options, and tweak and adjust every aspect of a quiz. That was what I initially loved about their website. But life gets in the way a lot for me, so just grabbing a ready-made quiz and adjusting a few things (button colour, font, etc.) I was still able to get a quiz up and available to my audience without spending a ton of time on it. That’s very important in my working mom life! 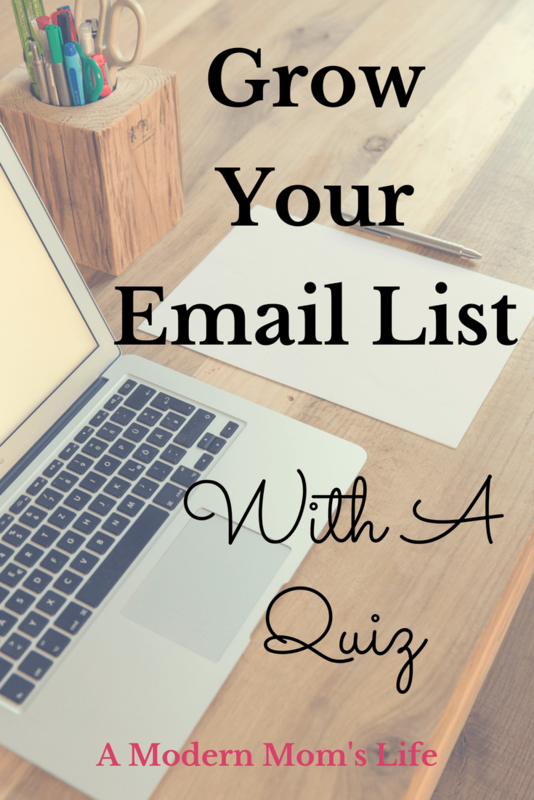 Have you used a quiz before to grow your email list? Was this post straightforward enough to help you out? Leave me a comment with your experiences with quizzes or other techniques to grow your email list. I’m still struggling with getting people to join up, and with sending out newsletters and bulletins that people are actually interested in reading. Sign up below to become a part of my blog journey and learn along with me! I have never thought to use a quiz to grow my blog reach; this sounds like it was easy! Have you noticed a marked increase in your readership? Wow…this is such great timing. I was just thinking about doing this. Did you make a quiz Jodie? It wasn’t nearly as hard as I thought it might be! Hey Jess! What a fab way to grow your email list. I need to up my game and spend some time on the subscription side. So much to do and little time to do it! Hey Lisa! I actually haven’t seen a great bump in my readership – but some of that is on me. I’m still trying to find the best way to share my quiz so others can see it and take it! Having it as a page on my blog is great to keep people on my blog, but when I share it from there it doesn’t look great on social media. There’s still a learning curve going on here! Glad I could share a little inspiration. It’s an interesting way to generate leads! I’m still learning how best to use the quiz, but it’s a different approach to list building! Thanks for sharing how this worked for you and that this tool is available! Happy to share Angie! Thanks for visiting!